This is my first post as a Growing In Unity gal. I am very happy to be able to lead you through one week of fun, by sharing creativity and this wonderful hobby of crafting/Scrapbooking. Remember to follow all my five posts this week. There will be one each day from Monday to Friday. 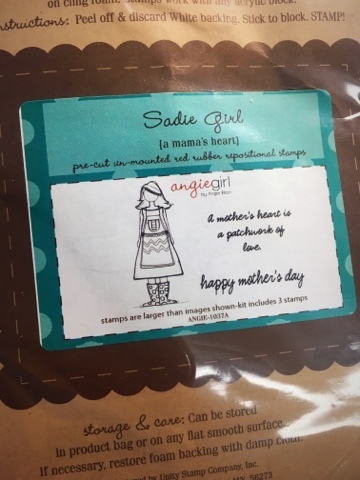 I will share with you some projects using stamps from Unity Stamp Co., and you can make comments, ask whatever you want, get inspired and simply have fun. At the end of the week I will randomly choose two winners to get 25 stamps from generous Unity Stamp Co. How cool is that? I have created several projects just for this week. I tried to have different styles and techniques so we can have even more fun sharing all. 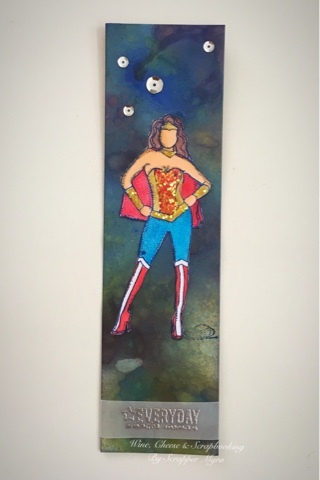 The first project I want to share with you is a bookmark. I chose to use this image for the fist GIU project because it is exactly how I feel. I am Wonder Woman this week. LOL! The WW image was first stamped in the galaxy to mark her position. Then It was stamped separately in an ivory cardstock. I used Copics, watercolor pencils/paints and acrylic paint to color this lady. I also added some glossy accents and glitter to certain sections I wanted to emphasize. Then I cut the image and adhered to her position in the bookmark. Finally, I stamped the sentiment in vellum and applied embossing powder to heat and melt and get it fabulous. Some sequins always support a nice final touch. Hope you liked my first project. Don't forget to comment below and in my Facebook page. You'll find me as Scrapper Myra. Posts will be originated in my blog and you can visit everyday to read the post and comment. You will want to comment on all five posts because at the end of the week I will choose two random winners to receive 25 stamps from Unity. But there's more... I will share the link in my Facebook page too. If you like my page, and also follow the Facebook posts interacting with likes, comments and shares, you will participate in another draw to win a kit from Unity (this one"s on me!). Here's a photo of the kit I will be giving away to a Facebook winner. 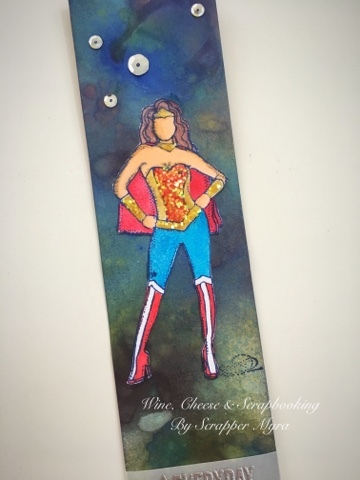 Love Wonder Woman, and your tag rocks it! The colors are amazing but the glitter on her bodice! LOVE! Congratulations on being the GIU girl! This bookmark is beautiful! I don't have the Wonder Woman stamp but now feel I need it! Beautiful bookmark. Love all the colors. Might have to get that stamp. I LOVE this card!!! And think I need to buy the stamp set. I have bought my sister all kinds of Wonder Woman things--a backpack, pencil bag, notebook with her name personalized on it....because she IS Super Woman!! Love this bookmark! This is the perfect background for this stamp. The added accents on her look amazing. I definitely need to add her to my wish list. Great first project! Can't wait to see what you have done the rest of the week! Looks like I may be adding her to my wish list also! The background is great! Perfect for the galaxy effect you were going for. Excited for tomorrow's canvas project! Thanks for such a unique project. Had not seen this stamp while browsing Unity, but you've enlightened me & now it's a must have. I love your bookmark! Super cute! That background is gorgeous. Love the use of sparkles for the red and yellow. I have this set, but hadn't thought of adding sparkles. Makes for an awesome and inspiring book mark! Like the bookmark and the different techniques to make her stand out and be yours. This would be perfect for her. I will have to get that stamp! Your Wonder Woman rocks! I love the universe background...the image just pops off of the bookmark. Great job! WOW! Que muchas técnicas utilizaste. Me encanta el tema y la combinación de colores. Love this bookmark!!! Wonder Woman is so fun, I love how you added glitter and glossy accents, it makes her pop so much more. The background is gorgeous too. Thanks for sharing your inspiration with us!! Love the background on your tag. This Wonder Woman stamp is becoming a favorite of mine. Thanks for sharing this project with us. Beautiful bookmark, love the background! Love your bookmark!! Diana girl is one of my favorites!! I love your bookmark. Great colors and wonderful stamp set. What an awesome bookmark! I love her sparkly outfit. You did a marvelous coloring job of her and the galaxy! Love your bookmark! You colored her perfectly and the glittery accents are yummy!! Heading off to FB! Happy Unity week! 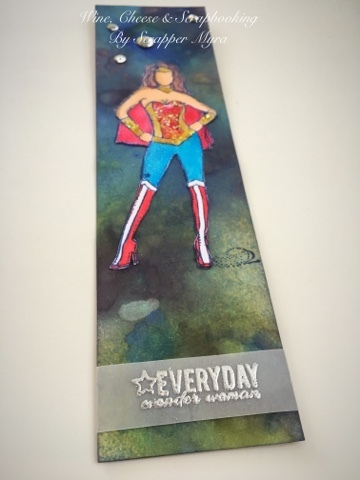 Love your bookmark! The coloring of Wonder Woman is great, and I love the background! What a great project to start out your GIU week! The Wonder Woman image is already amazing, but with that background and the glitter...WOW! I can't wait to see what else you share with us. Bookmarks!!! I love this idea for those times you want to create, but don't need a card! Wonder Woman pops for sure, and the background is awesome....I may try it with distress inks! Beautiful! what a great Wonder Woman tag. very impressive. One of my favorite stamps! Love Wonder Woman!! Your tag is fab! Thanks for sharing. I just love your background you created. It really makes your focal image pop. You have a great eye for detail. Everything about this is wonderful! 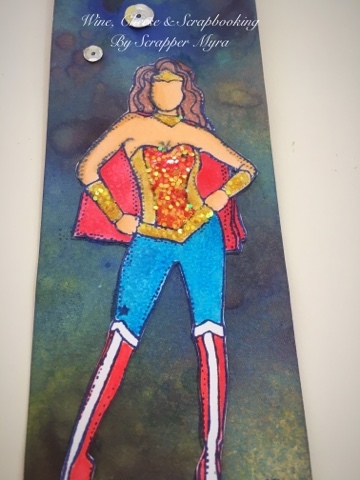 The vellum sentiment, the glitter accents, the Wonder Woman theme, and your gorgeous background! Because Sometimes I Don't Stamp!